The single nuclear reactor Ft. Calhoun station near Omaha, Nebraska was inundated by Missouri River flooding in June 2011. 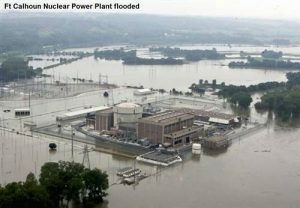 Missouri floodwaters also threatened the Cooper reactor in Brownville, Nebraska, which narrowly escaped a shutdown. Ft. Calhoun was permanently closed in 2016, but still “stores” 600,000 to 800,000 pounds (300 to 400 tons) of high level radioactive waste fuel in the floodplain. Indeed, Reuters reported Aug. 4 that Electricity de France (EDF) in Paris shut down four nuclear reactors at three sites due to the heat summer wave. EDF, the mostly government-owned utility, ordered the shut downs because the scorching summer heat that slammed Europe drastically raised temperatures in the Rhone and Rhine Rivers. Temperatures reached 98.6°F in the Rhone valley, home to 14 reactors. Highs in Spain and Portugal in early August hovered around 104°F and reached 116.6°F. The warming of seawater caused by Europe’s heat wave forced Finland’s two Loviisa reactors, about 65 miles outside Helsinki, to reduce power in July, just as it did before, in 2010 and 2011, Reuters reported. The July 2006 heat wave also forced European reactor operators to reduce or halt production due to dramatic increases in the temperature of river waters. The Guardian reported back then that Spain shut down its reactor on the River Ebro. Reactor operators in Germany also cut output then, and several German and French units were allowed to temporarily violate temperature limits on the hot water the reactors return to rivers. In 2003, temperatures in French rivers reached record highs that also forced the temporary powering down of four reactors. France’s nuclear oversight authority then gave some reactor operators permission to return the river water at temperatures not normally allowed, a move that critics said would endanger fish and add to global warming. But the NRC is not concerned about storm surges. In August 2017, as Hurricane Harvey pummeled east Texas, environmental groups called for the immediate shutdown of the two South Texas Project reactors near Bay City. Instead, the twin, 42-year-old behemoths were kept running at full capacity throughout the disaster, the wettest tropical cyclone on record in the United States. “The climate change argument is where the industry is majoring its efforts. Industry bodies point out that some of the countries with the best records on carbon emissions use a combination of nuclear and renewables, while claiming that nuclear plants have avoided carbon dioxide emissions.